One of the Washington Association of Wheat Growers’ (WAWG) newest board members is Terry Harding who represents Lincoln County. Harding is the fifth generation on his family’s farm in Sprague (established in 1872), where they grow dryland wheat, irrigated and dryland hay and manage a small cow herd. 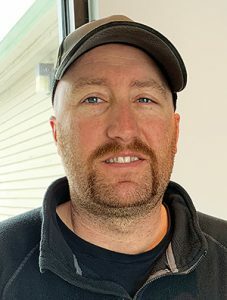 Harding returned to the farm in 2003 after a stint working as a mechanic at the Washington State Department of Transportation (WSDOT). He said even though he was working full time at WSDOT, he spent the weekends helping his father. “I knew I would be back at the farm at some point. We got the opportunity to pick up some more ground, and my dad needed a little more help, so I came back,” he said. Harding has also been involved in the National Barley Growers Association and said since the family’s main crop is wheat, he felt like he needed to be involved in WAWG. Harding and his wife, Shinna, are expecting their first child this year.